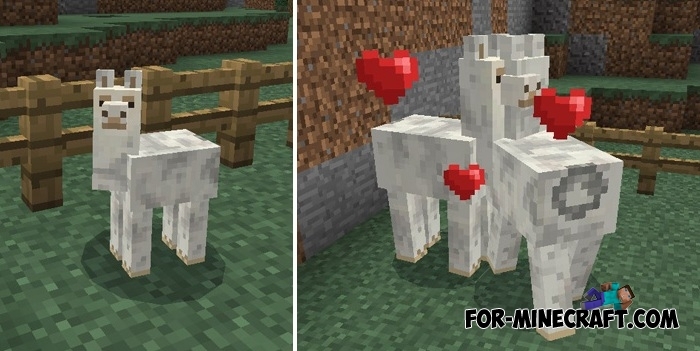 If you want to have a truly useful creature that will help you, then download the Llama mod for Minecraft PE. This modification works for version 1.0.X/1.1 and the developer updates it frequently. The idea is simple: you get a real llama which is able to perform some useful actions. For example, you can ride on it or move your things in its inventory. It's really a good add-on if you need a four-footed creature. Four llamas are available for you with different colors suitable for any biome. For example, a white lama is ideal for a winter biome, where it looks harmonious. Grey Lama can live in dense forests or live on your farm. The latest version of MCPE already contains the llamas so the installation of the addon is meaningless. But these llamas have a small drawback, they can not be used for riding and are mainly intended for transport of things. To fix this you will need a fourth version of the addon that allows players to ride the llamas. Possibility to ride the llamas. Put a chest on the llama to get extra slots. Lamas can accelerate if you keep wheat. Possibility to arrange a caravan using leashes. Now you can add one of the four different lamas. Each one has a specific color but the same characteristics. Number of inventory slots was reduced. You can not carry a lot of things, take only the most necessary. How to get a llama? Llamas live everywhere and you can easily find it. Moreover, you can breed them by using wheat. Just feed the two llamas and after some time you will see a baby llama. To ride it use the carpet. Then take into its own hands a carrot on a stick and boldly control the direction. Llama has a small moving speed but is very useful for the transport of things. If you often visit the mines, be sure to grasp with itself the llama. Inventory has 27 slots that can be used to store all your items. 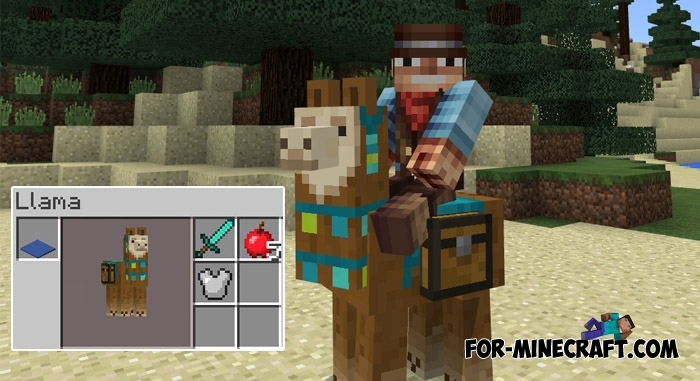 How to install the Llama mod? Download the archive below and extract it. Activate these files in the world settings (choose the color you want).